When is it safe to take fire sprinklers offline? Free Gift! Download a pocket guide for taking fire sprinklers offline. Lately, the news has shown many cases of secondary fires or flair-ups that grow out of control because fire sprinklers are offline. Once a fire sprinkler activates, the sprinkler heads cannot be used again. Until they are replaced, they cannot activate again - hence, the issue of secondary fires. Another reason that fire sprinklers are not activating when a fire ignites is they were taken offline when they didn't need to be. The question is when is it appropriate to take fire sprinklers offline? If the fire sprinkler system needs to be repaired, hire a professional to take the fire sprinklers offline and make fire sprinkler repairs. Before fire sprinklers are taken offline, place a fire patrol in the area and hire a fire sprinkler technician to properly take the fire sprinklers offline. If done improperly, major issues could result. Additionally, call the AHJ, security guards, and the central alarm station to notify them that the sprinkler will be taken offline. Never take fire sprinklers offline when hazardous activities are taking place. If welding or other fire-related activities are scheduled, keep the fire sprinklers online. Fire sprinklers are designed to save people, property, and production. When they are taken offline, they cannot do their job. 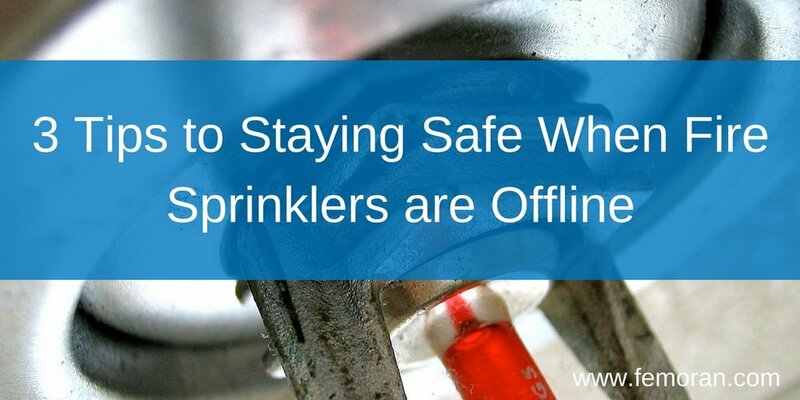 Make sure to always take safe precautions before making the decision to take fire sprinklers offline.